This 7-lesson online course builds upon the firm foundation in creation apologetics laid by CAP 101: Fundamentals of Creation Apologetics. 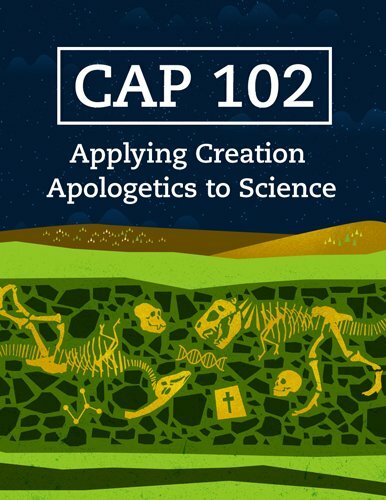 CAP 102 will demonstrate how creation apologetics apply to scientific discussions, such as the origin of man and dating fossils. You will be introduced to important concepts in biology and geology to become better able to provide answers “to anyone who asks you a reason for the hope that is in you” (1 Peter 3:15, ESV). Choose this option if you do not wish to receive Continuing Education Units for this course. Includes $10 fee for Continuing Education Unit processing. State why an evolutionary worldview is inconsistent with the teachings of the Bible. State how a global flood is presented in the Bible. Use principles of logic to expose and avoid invalid arguments. Explain inconsistencies in compromise theories such as the gap theory, progressive creationism, and theistic evolution. Use biblical truths and scientific examples to refute evolutionary claims. Answer questions from skeptics on biblical authority and scientific validity of biblical creation. Identify fallacious arguments within fields of science. Be ready to give a defense for the hope of eternal life found in Jesus Christ alone. Share the gospel with confidence. A digital certificate of completion will be awarded to those finishing the course with a final score of 75% or higher. Students should expect to spend 4–6 hours per lesson watching the videos, reading the articles, asking questions in the forums, and taking the quiz. Complete the coursework at your own pace within six months. Parents or teachers seeking to use this course for high school credit can consider this the equivalent of one-half semester of social studies credit.